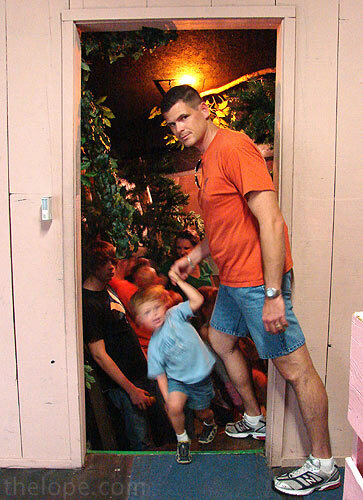 Mystery Spots - vortexes that defy science, or just tourist traps designed to grab your dollar before the dinosaur park up the road gets it? Read on. 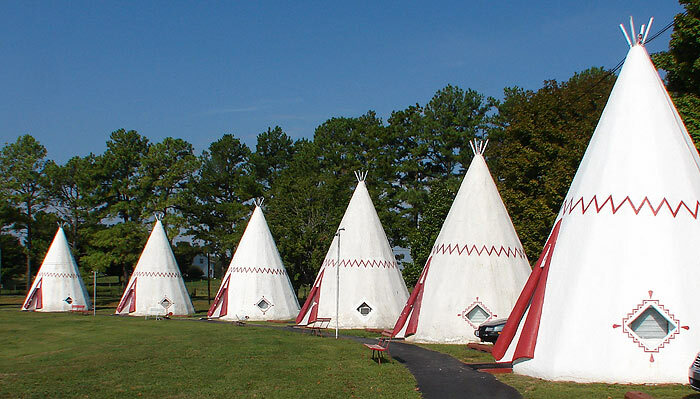 Ace Jackalope voyaged to Cave City, Kentucky, in 2007 to stay at the Wigwam Village #2 and visit Mammoth Cave. 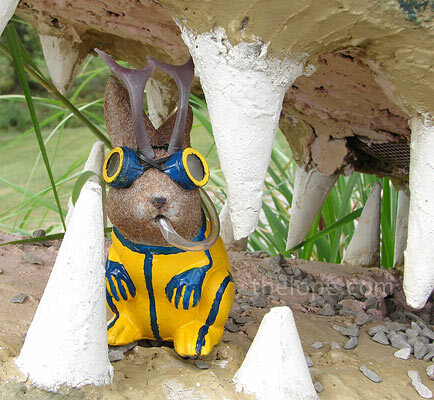 Outfitted in his scuba gear, Ace sought to go cave diving. How very odd that vegetation is visible just beyond these stalagmites and stalactites. There appears to be a slight navigational problem. 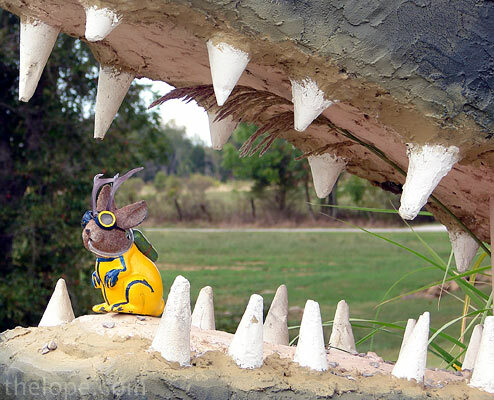 Ace quickly left, realizing he'd found his way not into a cave but rather the mouth of Big Mo, a concrete mosasaur that has been in place since about 1996 in front of Big Mike's Rock Shop. 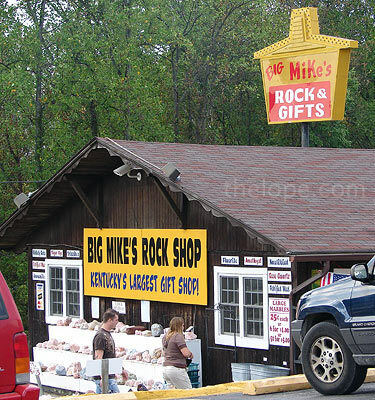 Big Mike's address is 556 along Old Mammoth Cave Road, a stretch of touristic cheese that also holds the defunct Golgotha Fun Park. Is that an old Pizza Hut sign? 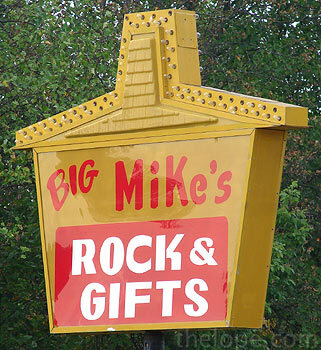 Big Mike's has the usual rock shop stock - fossils, slag glass, regional souvenirs - that sort of thing. 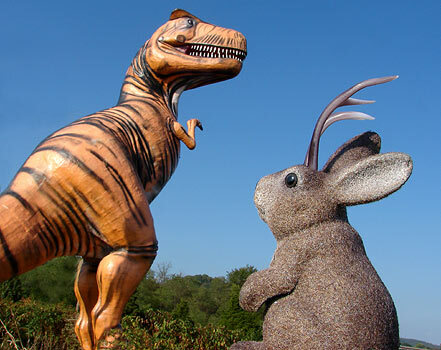 Inside are some nice fossil exhibits as well as the usual ones for sale. 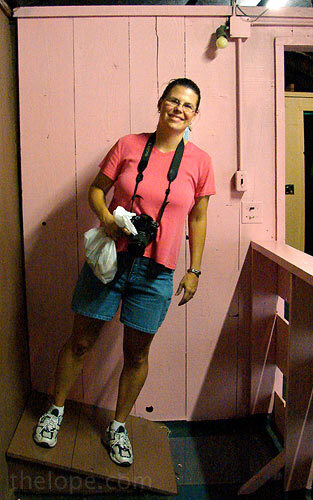 Attached to Big Mikes is the Mystery House, one of those places where gravity falls victim to creative carpentry. 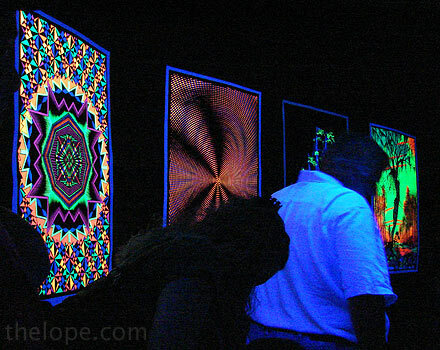 Well, not so much, unless you're horrified that you let go of a dollar to see this, or unless the black light room sends you into 1970s flashbacks. 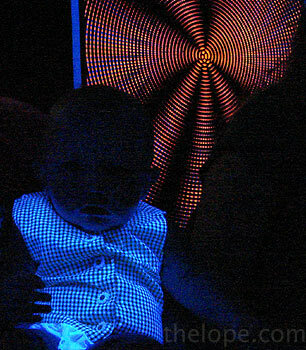 Actually, I find black light baby a little unnerving. These people used whatever they could find. 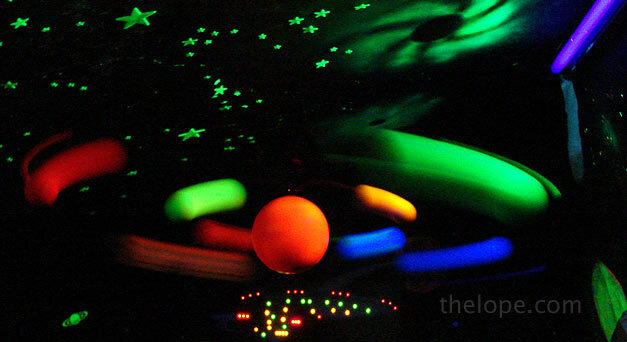 There's an LED poster of the Enterprise (Picard's, of course) beyond this fluorescent solar system. 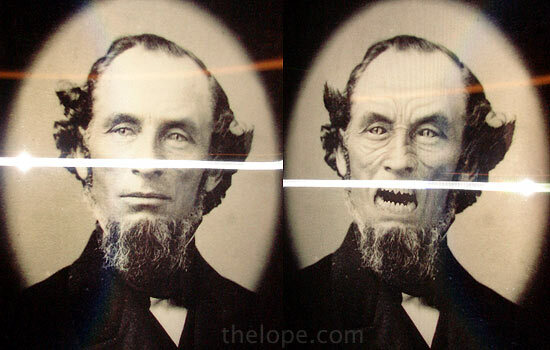 This sort of lenticular has become more common and available since my 2007 visit to Big Mike's. The side of the structure betrays the twisted vortex within. 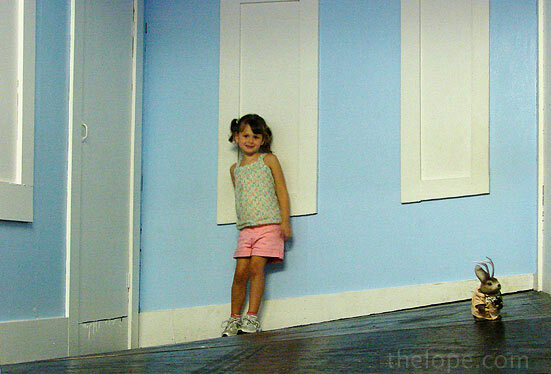 Aside from being difficult to walk in, I'm not sure what perspective this room was meant to give. 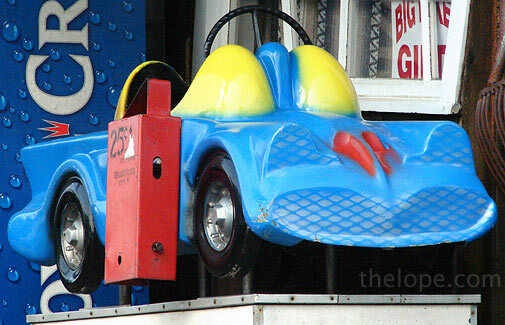 Out front was a nice bit of nostalgia - a 25-cent Batmobile ride. 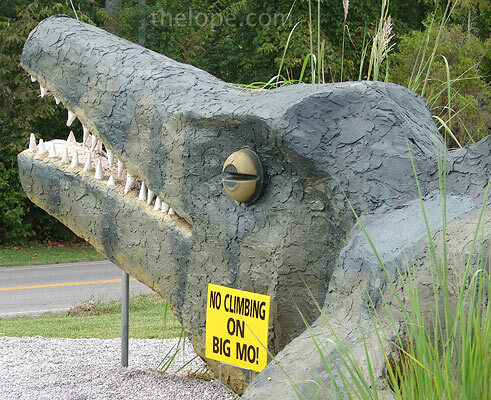 Just remember - no riding on Big Mo.